It was a nationwide craze for over a decade, and Rock Island played a small part in it. 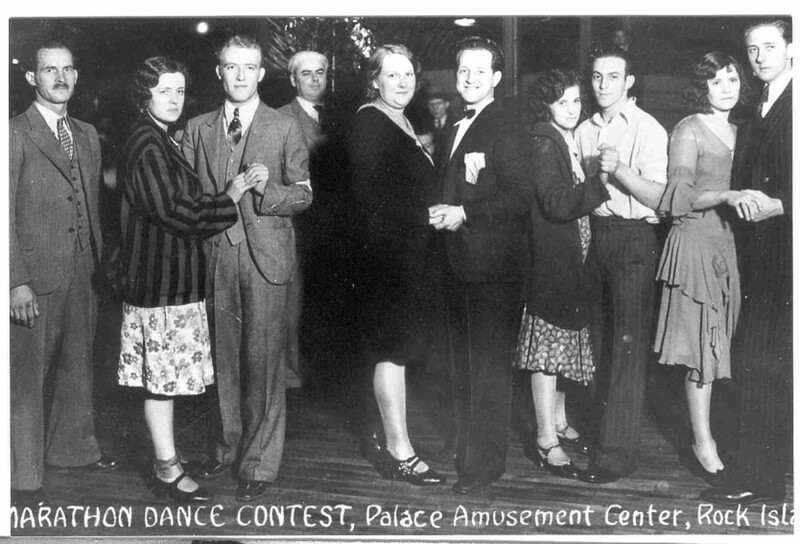 Our postcard today is captioned “Marathon Dance Contest, Palace Amusement Center, Rock Island.” It was one of many postcards, most originating before 1920, that Robert Schroeder inherited from his grandmother, Mrs. Emma Holzer. This professionally produced Real Photo postcard, however, dates from 1930. Marathon dancing began 1923, when an American girl in England danced for 27 hours straight, wearing out several partners in the process. After that, marathon dancing swept America. Like other crazes of that era such as flagpole sitting, it started as a fun way to express the exuberance of the 1920s and maybe win a cash prize, too. But after the stock market crash of 1929 threw many out of work, the marathon dance event began to show an uglier side. Rock Island’s version of the marathon dance almost didn’t happen. The first brief coverage in local newspapers was on November 26, 1930, the day before Thanksgiving, said simply that ‘Objections have been ironed out,’ the Rock Island City Council had relented, and the marathon dance would begin that evening in the old Daniel Boone Building. Fourteen couples had entered the contest. A few days later it was reported that the marathon dance had attracted a crowd of 3000 — these would have been paying customers — to witness the 100th hour of the dance. Of the fourteen couples who had started, already five “boys” and three “girls” had given up. Two girls were dancing alone, waiting for a potential partner from another couple break-up. If they didn’t find a partner within 24 hours, they, too, would be out. Calling the participants boys and girls wasn’t totally inappropriate. The stress of the marathon dance attracted mostly young adults. Women often outlasted the men in these contests. Although dancers hoped to win the cash jackpot by outlasting everyone else, the paying audience was really what marathon dancing was all about. That income allowed the dance promoters to offer cash prizes as well as food and medical attention for the dancers. Another cost was live music, typically provided in the evenings. Finally, the promoters had to make a profit. An inadequate audience couldn’t even bring in enough to make expenses, much less a profit. Attrition of the Rock Island dancers was faster after this point, and it appeared that public interest may have waned as well. On December 4, it was reported that the six couples remaining would be moved to the gymnasium in the building so that the main auditorium could be used for an amateur charity boxing show, which would presumably attract a larger audience than the dancers. At the 200th hour, the Argus reported that five couples remained, with an additional dancer, Vivian Giblin of Rock Island, dancing alone. The article also stated that cots were being placed on the dance floor so spectators could even observe the dancers during their 15 minute rest period. Typically dancers were permitted 15 minutes every hour or two for eating, sleeping, and personal hygiene. And that was the last newspaper report we found. When did the dance end? Who won? And who are those folks on the postcard? Unfortunately our research couldn’t provide the answers. But we did resolve some other questions. First, we discovered Mrs. Holzer’s connection to the dance. It was her nephew, Herman “Babe” Brandle, who operated the Palace Amusement Center and was the marathon promoter. Herman and his wife Vera had lived across the street from the Holzers before moving into an apartment in the Palace Building. We also found that the old Palace, originally the Daniel Boone Woolen Mills, is still standing on the northwest corner of 5th Avenue and 13th Street. It was built in the early 1920s by a group of Rock Island businessmen and leased to the Daniel Boone Woolen Mills. That business only lasted a few years, and by 1928 the building was vacant. It was used intermittently for exhibitions, including auto shows, but the many interior structural columns created problems. In February 1928, architect Rudolph Sandberg, citing the need for a modern civic center, drew plans that would add new roof trusses to allow a central open exhibition space 80 x 240 feet with a ceiling height of 30 feet. The existing “sawtooth” roof would simply be lifted upwards. The outer edges of the building contained a kitchen, large and small banquet rooms, offices, and big restrooms. There was a large stage at the east end while the main entrance was at the west. These plans do not appear to have been carried out and the columns continued to limit the building’s use. For a year, the Boone Building was the home of the Lighthouse Gospel Tabernacle, and then Babe Brandle opened the Palace. It would seem to have been a good business decision. The location was excellent, in a stable, mostly residential, neighborhood that was easily accessible from roads and streetcars. In addition to dancing, the Palace offered skating and, apparently, boxing. Yet this was a bad time for any new business. In 1930, the Great Depression had hit the Quad Cities hard. Newspaper pages were filled with stories of newly laid-off workers. After only a year in business, the Palace was closed and a garage was opened in the building. That, too, didn’t last and the former Palace began its long career as a warehouse. For some years, Brandle Roofing used the space, but others would come and go through the years. The lack of newspaper coverage was probably due to the public disapproval that was being shown marathon dance events. Just like today’s reality shows, they were considered exploitative and even dangerous. By 1930, marathon dancing had been outlawed in many communities and, beginning with Texas in 1931, even statewide bans were passed. The old Daniel Boone Woolen Mill, the Palace, still stands, its original one-story brick walls now covered with imitation stone. The main Palace entrance at 440 13th Street has been removed and many large overhead doors have been added on all sides of the building. Most recently the building was the home of the Fancy Street Lighting Company, which is no longer in business. That company created the clock that stands at the 5 points intersection at 18th Avenue and 17th Street. Yet remnants of the original architecture can still be seen. There are large arched windows which would have flooded the interior with light. And the expensive zigzagged sawtooth roof with its rows of skylights, that would ensure good ventilation and daylight in interior regions of this large building, remains. Today, the Department of Energy suggests that sawtooth roofs have an excellent configuration to outfit with solar collectors on the south and windows on the north. The people on the postcard remain unidentified. There are too few to be the starters in the marathon and, although the four couples appear young, they don’t look tired enough to be among the finishers, who danced at least three weeks. Special thanks to King Cutkomp and Patrick Brandle for providing Brandle family information and additional photos. This article by Diane Oestreich is slightly modified from the original, which appeared in the Rock Island Argus and Moline Dispatch on March 5, 2006.